Our goal is to truly earn our title as The Surfer’s Surf Shop. We’ve grown up with the surf industry and because of that we know products and services inside out and strive to be on the cutting edge of the latest trends and technologies. We’ve got five stores to provide the best level of support possible for the Gulf Coast’s boarding and beach-going communities. 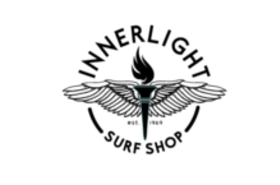 Started in 1969 by founder Yancy Spencer (who changed the name to Innerlight in 1972), Innerlight grew from a 400 sq ft cinder block building…into 4 locations from Pensacola, FL to Destin, FL. Yancy co-owned Innerlight with his brother JB (Spencer) Schluter. Yancy passed away in February of 2011 after surfing all day at one of his favorite spots in California. Since then the torch has been passed on to his family to continue in the same path. Innerlight is very involved with it’s community and sponsors many events, schools, and teams. Stop by any location and you will see why many people see Innerlight as a second home.